Avoid an unpleasant, unexpected dose of cold water by keeping tabs on your hot water heater's age and condition so you'll know when to replace it. Among the benefits of the timely installation of a new water heater, you'll probably enjoy lower energy bills—as well as uninterrupted access to hot showers. Q. We just bought a house, and the previous owners told us that the water heater is about six years old. Does that mean we’ll have to replace it soon? How long does a water heater last? A. As long as it’s still heating water sufficiently, without leaks or strange noises, you might still get a few more years of service from it. A water heater’s useful life varies, depending on the type of water heater, the quality of the unit, and how well it’s been maintained. A traditional tank-type water heater lasts an average of eight to 12 years. Inside the tank, an anode rod protects the interior lining by attracting all corrosive particles to itself through a process called electrolysis. When the rod has corroded to such an extent that it can no longer do its job, those particles settle at the bottom of the water tank, where they eventually destroy the lining. Once corrosion starts inside the tank, the water heater has entered into its final stage of life. A tankless water heater can last up to 20 years, sometimes even longer. Also called “on-demand” water heaters, these appliances do not work continuously to maintain a supply of hot water—and, as a result, they last longer than their tank-style counterparts. 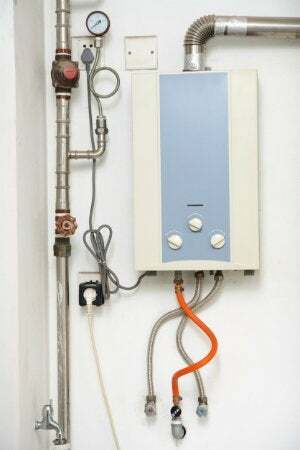 Eventually, though, tankless water heaters (which do not use anode rods) will also suffer from corrosion and require replacement. Your existing water heater’s serial number holds the clue to its age. Even if you can’t track down the documentation for your current appliance, you can examine the serial number, which consists of a letter followed by a series of numerals, located on the upper portion of the water heater to determine when it was manufactured. Typically, the letter stands for the month—“A” for January, “B” for February, and so on, through “L” for December—and the next two numbers indicate the year it was made. A serial number that leads with “A10,” for example, was manufactured in January 2010. This rule of thumb applies to most hot water heater manufacturers, but you can confirm this on the company’s website if you have any doubts. As you enter the second half of your water heater’s life, watch for the signs of an aging appliance. Should you notice any of the following, start shopping for a replacement before you get caught by surprise. • A banging or rumbling noise often occurs near the end of a heater’s lifespan. While manufacturers recommend annual flushing of a tank-style water heater—and it’s a requirement for keeping a warranty in effect—few people actually follow that suggestion, so calcium buildup from hard water collects in the bottom of the tank. The sediment builds, hardens, and eventually forms a thick crust that can cause the water heater to creak and bang when in use. • Tinted hot water, either red or dirty yellow, coming from any faucet could mean rust. It’s important to determine whether the discoloration also appears when the cold water is running; if not, your problem probably originates inside the water heater rather than within rusting galvanized piping. • A drop in water temperature: If water doesn’t heat up as much as it used to or for as long, the water heater may be nearing the end of its service life. • Water pooling around the base of a water heater tank also suggests bad news. First, check to make sure the leak isn’t coming from a fitting or valve that just needs to be tightened or replaced; call in a professional to check out the problem and perform any necessary maintenance. If you find the leak comes from the tank itself, it may be cracked or corroded internally. Water quality and location can affect a water heater’s life. Hard water wreaks havoc on a water heater and can reduce its service life by two or more years. 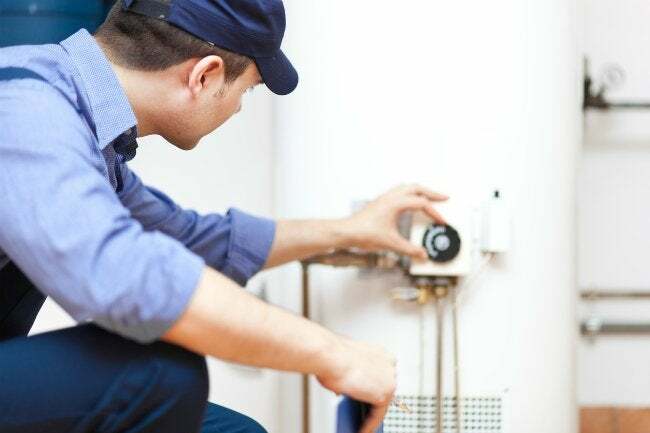 Likewise, water heaters located in garages or crawl spaces, where the temperature drops significantly, have to work harder to heat the water, and they tend to wear out more quickly than units installed in a temperature-controlled house. If either of those elements factor into your setup, start looking for end-of-life warning signs earlier than the manufacturer recommends. Call the manufacturer if the water heater is still under warranty. While the above issues can signal the end of an aging water heater’s life, if your unit is only a few years old, the problem could be repairable. It may be worth calling the manufacturer or a plumber to check the appliance out before you invest in a new model. Start thinking about replacing your water heater two years before the end of its predicted lifespan. When a tank-style water heater approaches eight to 10 years of age, or a tankless water heater approaches 15 to 18 years of age, it’s time to start thinking about replacing it—not only to avoid the annoyance of breakage and the inconvenience of having no hot water, but also to minimize energy consumption. After several years of use, either type of water heater is subject to mineral deposits and sediment buildup that can cause it to require more power to heat water, reducing the appliance’s overall efficiency. Install a replacement, though, and the combination of a decade’s worth of technological advances and the new model’s clean interior mean that your utility bill is sure to drop in the months to follow.